I'm thrilled to be mounting 'Walking in Plantain's Footsteps', a participatory performative inquiry with the common plant Plantain, on Saturday August 11th as part of Lisa Hirmer's show 'Of Containers and Firestarts' at Cambridge Galleries. More info on 'Walking in Plantain's Footsteps' here. More info on 'Of Containers and Firestarts' here. REMEDIATE: NESTING - Ongoing quilting performance and workshops at the ReMediate sculpture. May - June at Eastview Park, Guelph. SNAIL'S TRAIL - Site-specific performance and installation in collaboration with poet and philosopher Karen Houle for the Tom Thomson Gallery's off site exhibition series Lands Apart / Worlds Together. June - July at Kepple Croft Gardens, Big Bay. My collaboration with poet and ecologist Madhur Anand, The Strategy of the Majority, is now on view at 60 McTague St, Guelph. It will be touring through the Open Field Collective's Street Projects in Guelph and Toronto to fall 2018. 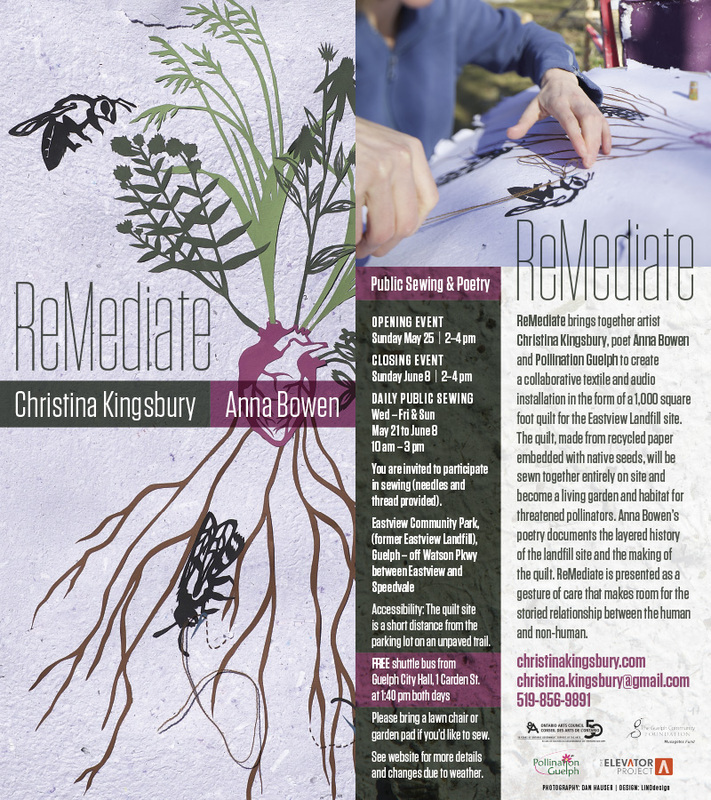 ReMediate, my collaboration with poet Anna Bowen and Pollination Guelph in the form of a 2,000 square foot quilt for a landfill, will be presented at the Art Gallery of Guelph's Boarding House Gallery from June 4 - July 23. Despite the rain, I will be out sewing today under my canopy tent from 10am to 1pm. I will clear out if there is thunder or lightening. Due to the severe thunderstorm and lightening warnings and the tornado watch, tonight's Public Sewing will be cancelled. If the weather is nice tomorrow evening (it looks like it will be) you can join me then from 6:30-8:30pm. Despite the rain I am on my way to the site. I have a canopy so you'll stay dry if you join me. Click the site map image below for a Google map to the site. Enter Eastview Community Park off Watson Road just south of Speedvale Avenue. From the end of the parking lot follow the red line on the site map, which is a service path, to the ReMediate site on the right, indicated by the white rectangle. You will see the bee house and a large water container marking the site. 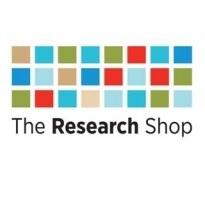 Anna and I will be speaking about ReMediate on Andrew Vowles' radio show 'From the Second Storey' tomorrow, Monday June 2nd, from noon to 1pm on CFRU 93.3 FM. Andrew also wrote an article about the project in Thursday's Guelph Mercury. Rob O'Flanagan covered the opening in Monday's paper. and thanks to Bryan Webb, who recently gave a shout out to ReMediate as 'a mind-altering work of art' in an interview for Exclaim! Magazine. Due to wet weather, there have been delays getting the soil to the landfill site, so the daily sewing will begin this Sunday, May 25th. I will be onsite Wednesday to Friday this week preparing the ground and, hopefully, spreading soil once it is delivered. The opening on Sunday, May 25th, will proceed as scheduled.